Fractal Design has a new case series that it hopes will solve one of the biggest problems plaguing system builders—wasted space! Okay, maybe it's not that big of a problem, but as far as Fractal Design is concern, the one-size-fits-all approach to case design isn't doing builders any favors, and so it came up with the Define C series. "Smaller than the usual ATX and micro ATX case, the Define C and Define Mini C with its optimized interior provides the perfect base for users. 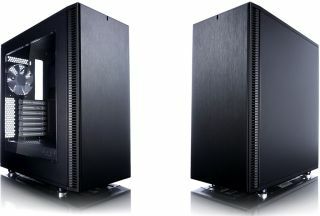 The open air design offers unobstructed airflow across your core components with high performance and silent computing in mind at every step," Fractal Design says. So basically the Define C and Define Mini C are smaller versions of your typical ATX and micro ATX chassis so you don't end up with a case "full of empty bays, unused mounts, and excess bulk." We're not sure there's a huge issue with finding an appropriately sized case, but whatever, Fractal Design typically puts out good stuff and this just adds to its product portfolio. There are two versions of the Define C, one with a window and one without. Both measure 543 x 290 x 484mm (LxWxH) with the windowless being slightly heavier at 7.4kg versus 6.8kg. The Define C has seven expansion slots and room for five storage drives split between two 3.5-inch bays and three 2.5-inch mounts. It can also fit ATX PSUs up to 175mm deep, CPU coolers up to 170mm in height, and graphics cards up to 315mm in length. Cooling is handled by two included 120mm fans with spots for five more. Fractal Design also makes mention of an open air design, though it's referring to the lack of obstructions in the main housing area; it's not actually an open-air case that leaves parts exposed to the surroundings. Other notable features include sound dampening material to the sides and front, Velcro straps for cable management, and 15-35mm of space behind the motherboard tray to tuck extra cabling. The Define Mini C looks virtually identical to its bigger sibling, only it's smaller at 399 x 210 x 399mm and weighs less (6.9kg and 6.3kg for the windowless and windowed version, respectively). Unlike the regular Define C, the Mini version can't swallow full size ATX motherboards—it's micro ATX and mini ITX only. However, it can fit the same amount of storage drives and has just one less fan mount. Just about everything else is the same about the Mini as well, including what size CPU coolers, PSUs, and graphics cards it can accommodate. Fractal Design didn't say when the new cases will be available or for how much. We've reached out for those details and will update this article when we hear back.